In return the Leafs will receive Jared Cowen, Colin Greening, Milan Michalek, Tobias Lindberg, and the second-round pick to the NHL Draft in 2017. No salary will be retained by either team, which is really good news for the Leafs; Phaneuf has the seventh highest average annual salary among defensemen in the NHL. “Dion’s ready now to win. We’re not ready to win”, says Leafs coach Mike Babcock. According to my research on NHL Trade Tracker, in terms of the amount of players involved, this is the second-biggest trade the Leafs have made in their history. The biggest trade they ever made was when they acquired Doug Gilmour from the Calgary Flames in a 10-player deal during January of 1992. It is also the largest trade Toronto has made since they first acquired Dion Phaneuf in a 7-player deal in 2010. 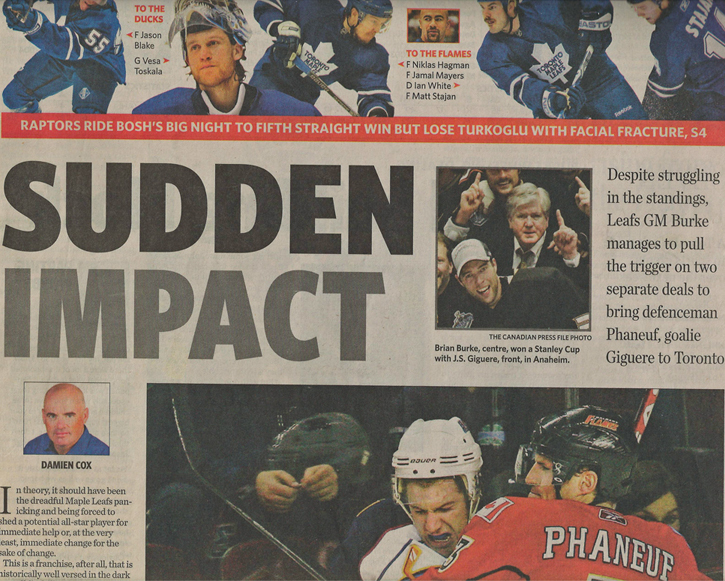 Here’s the front of the Toronto Star Sports Section when the Maple Leafs acquired Dion Phaneuf from the Calgary Flames in 2010 in that blockbuster deal. This time around, it’s a sudden trade by GM Lou Lamoriello, who is known for letting little information leak from his trade discussions with other teams over his career. It was TSN insider Bob McKenzie who initially reported that Dion Phaneuf’s name was being thrown around in some trade discussions, and just less than an hour later, a trade was announced by both sides. “The Senators actually began quietly kicking the tires on Phaneuf about six weeks ago. It started with an informal conversation with forward Clarke MacArthur, who was eating lunch in the players’ lounge at the Canadian Tire Centre. MacArthur had been sidelined with a concussion and was starting to feel better, showing up to the rink on a more regular basis. The senior members of the hockey operations department approached him to get some intel on Phaneuf, since MacArthur had been a teammate of his in Toronto.” – TSN.ca. This was personally my favourite moment from Phaneuf’s tenure in Toronto; his goal against the Bruins in Game Six during the 2013 NHL Playoffs. Good luck in Ottawa Dion! Also, here’s some of the Twitter’s reaction to the trade. the leafs have traded clarkson, phaneuf, and kessel in the last year or so, and retained just $1.2m of their combined $20.35m AAV. unreal. 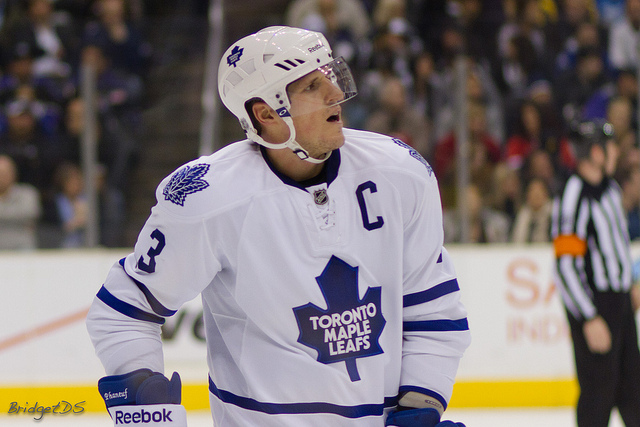 Dion Phaneuf is the first #Leafs Captain to be traded since Doug Gilmour was traded to the #NJDevils in 1997. Phaneuf will play in Detroit tomorrow night and will wear #2.